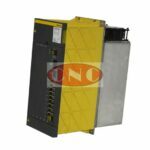 A06B-6082-H206 SPMC-5.5 Fanuc Alpha C Spindle module drive. This GE Fanuc Alpah C series spindle power amp fitted on smaller machine tools within the machining industries. DNC offer several services on this Fanuc C spindle drive, including exchange, repair, surplus parts, such as transistors, and plastic spindle cases, and in some cases, if stock permits complete used surplus Fanuc modules. Note: there are 3 versions denoted by #H510, #H511, #H512 – they are different A06B-6082-H206. The A06B-6082-H206 is in stock, and is available as exchange, however DNC can offer repair on this drive if cost is more important than time considerations.